The 12 June Singapore Summit has aged badly, as the declaration signed by Donald Trump and Kim Jong-un has proven as useless as most analysts imagined. Consequently, the current US-North Korea diplomatic process is disintegrating under the weight of the parties’ misaligned expectations. Kim wants to surrender as little of his nuclear weapons as possible, while still achieving sanctions relief. Hopes for reviving negotiations between Washington and Pyongyang rest with South Korea’s President Moon Jae-in, who has travelled to Pyongyang this week for talks with Kim. Beyond advancing inter-Korean cooperation, he will try to sell North Korea’s leader on a deal dubbed “declaration-for-declaration”: the US would agree to join a political declaration ending the Korean War (although not replacing the armistice), and North Korea would declare an inventory of its nuclear weapons program and stockpile. This seems feasible, but in fact “declaration-for-declaration” hides strategic and tactical risks for both sides. Thinking strategically, Kim wants to surrender as little of his nuclear weapons as possible, while still achieving sanctions relief. His best path for accomplishing this feat is to string out the unpredictable Trump and his administration’s hardliners, hoping for a less bellicose successor administration amenable to recognising North Korea’s nuclear weapons as a fait accompli. Anything that interferes with this plan, and especially any action putting Pyongyang on the clock for concrete denuclearisation measures or accelerating the denuclearisation timeline, is anathema. Providing an inventory of North Korea’s nuclear program does precisely this, as it tacitly functions as an admission that further steps should follow: nuclear program and stockpile monitoring, inspections and verification, limits and freezes, and eventually dismantlement. Taking the first step of providing a nuclear program inventory will come only in extremis, or with compensation greater than a mere political (non-binding) declaration of the end of the Korean War. Even then, it must be expected that North Korea will resort to delay and salami-slicing tactics. Pyongyang also has tactical reservations about the “declaration-for-declaration” proposal. Namely, if it provided a nuclear inventory, what items should Pyongyang list, and what items should it conceal? Washington does not have excellent intelligence on North Korea’s nuclear weapons program, but it is not blind either, and Pyongyang knows this. This presents a dilemma. On the one hand, if it deliberately understates the inventory and omits items about which the US can demonstrate knowledge, then North Korea risks alienating the US, South Korea, and even China. This would have serious diplomatic, economic, and (potentially) kinetic consequences. On the other hand, Pyongyang does not want to reveal more of its clandestine nuclear capabilities than necessary. If it gives away too much unknown technical information, the US and its allies could use this knowledge to expand their ability to hinder further nuclear program development, and, if necessary, defeat it militarily. A US political declaration of the end of the Korean War is not a satisfactory security guarantee to offset the risks of providing a nuclear inventory. From the US perspective, the “declaration-for-declaration” deal looks like a trap. The political declaration of the end of the Korean War would function as a thin end of the wedge giving political momentum for a Korean peninsula peace regime despite North Korea retaining its nuclear weapon program. This would also entail calls for the US to exit the Korean peninsula militarily and abrogate the US-South Korea alliance. After all, the US-South Korea military partnership is dedicated to deterrence against North Korean aggression, so what is the justification for US troops and strategic assets on the Korean peninsula, and indeed, for the military alliance as such, if the US and South Korea are no longer at war with North Korea? This fear could be mitigated by intelligence gains that North Korea’s nuclear program inventory might provide, if the Kim regime provided an honest declaration. However, few seriously believe that North Korea would make a good faith declaration. Washington is therefore wary – although not categorically opposed – to a “declaration-for-declaration” deal. Although unloved, “declaration-for-declaration” is the deal on the table. And not all hope is lost. Kim has incentives to maintain diplomatic momentum, and Moon will reiterate that the level of inter-Korean cooperation depends on Pyongyang’s denuclearisation efforts, which must include an inventory. Moreover, elements within the Trump administration, including both Trump himself and Secretary of State Mike Pompeo’s negotiators, are potentially willing to proffer the “declaration-for-declaration” gambit. Finally, there is some wiggle-room on the contours of the deal, as both sequencing and scope of reciprocal actions could convince Washington and Pyongyang that the deal is a win. One option is for North Korea to provide a limited declaration (encompassing only certain technologies, or facilities, for instance). 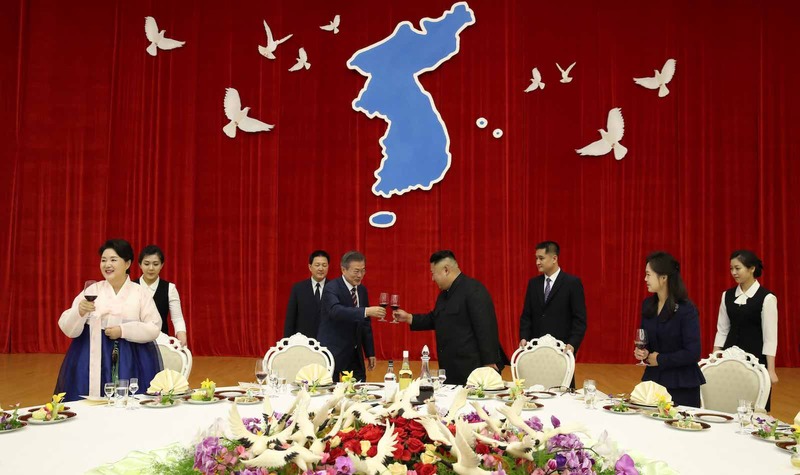 Another possibility is a four-party (US, China, North Korea, South Korea) peace declaration in exchange for verbal assurance from Kim that Pyongyang intends to denuclearise, and that it will start the process – beginning with a nuclear inventory, followed by concrete measures – quickly after the peace declaration. North Korea might be tempted by such an offer because its commitment starts on a lower level of the diplomatic ladder (verbal assurance rather than a written declaration). Washington would get an on-the-record, public commitment to denuclearisation by Pyongyang, as well as some Chinese skin in the game (important because Kim might be more reluctant to break its promise if Beijing were also to be aggrieved). If to jaw-jaw is better than to war-war, one must hope Moon is an able mediator.